MANILA, Philippines -- After the scary onstage incident involving Girls Generation’s leader Taeyeon, a video surfaced on the web showing a man attacking K-pop singer Wheesung. Wheesung’s incident happened last April 8 but the news, photos and videos only surfaced Tuesday after the Korean media reported Taeyeon’s April 17 incident where a man came up on stage and dragged her. Wheesung was a guest performer at the opening of the Nonsan Strawberry Festival last April 8 in Nonsan in South Chungcheong Province in South Korea. The event was organized by a local affiliate of Korean TV station MBC. He was singing “With Me” on stage when a man wearing a yellow hoodie calmly came up on the stage, approached the singer and attempted to attack Wheesung with a flying kick. Fortunately, Wheesung managed to evade the attack. 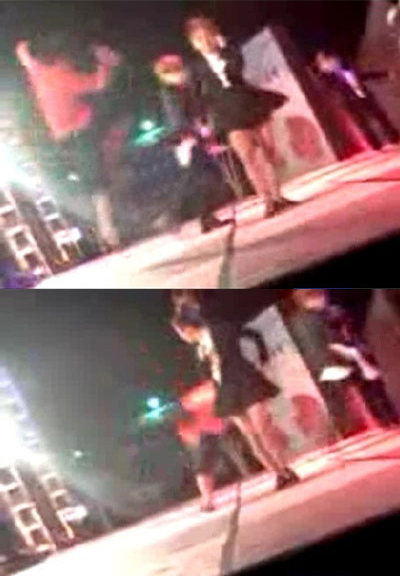 A security personnel immediately went to the stage and dragged the man to the backstage. Wheesung showed professionalism and finished his performance. The Korean media reported that the attacker was drunk. Last April 17, a man went on stage during Girls Generation’s performance at Angel Price Music Festival and dragged Taeyeon. Security personnel eventually arrested the man. It was revealed that the culprit was a university student. SM Entertainment and the Korean police decided not to press charges against him. Netizens are angry that event organizers did not provide enough security that could have prevented Taeyeon and Wheesung’s nasty incidents.